We’ve had a fantastic summer with Corey, so to some extent there was no pressure for the rest of the season. Except that I wanted to do a little bit more eventing for myself before the winter set in and inevitably put pressure on myself to do him justice. We aimed for Richmond after Somerford as an easy, fun day out for everyone. I stable with one of my best friends and then my parents take Corey home so we can spend the rest of the weekend chilling at the in-laws, so it is all very relaxed. This year it was extra relaxed because we were going HC in a standard 100 class in order to compete on the Friday. There was literally nothing to lose. Mum and I both agreed that as well as having fun, it was a great opportunity for me to practice riding without interfering too much and just letting Corey get on with the job. 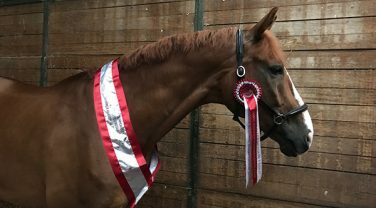 The dressage was really interesting – he warmed up quite tense and excitable, so I did a lot of experimenting with exercises to get him to relax. He did the first 18 movements of the test really well; calm, accurate, consistent and solid. The final two movements he started to get tense and against me slightly, which was disappointing, except they were the best marks of the test! I obviously need to recalibrate my ‘feel’ a little bit, but not too much – the clever boy got the best score in the section. The showjumping arena surface and jumps have had a revamp at Richmond, making it even better than usual. Corey rattled a couple of the poles but left them all up which was really pleasing. However, lots of people seemed to be spooking at the new shiny poles, and although I should have trusted Corey, instead I forgot my plan to just sit quiet and focus on the canter rhythm, and slightly overrode it all. A bit frustrating, but I was happy that my technique was improving. As we got ready for the cross country we were all in a very jovial mood, laughing about the last time we were at Richmond. Last time, it rained heavily all day and was really quite miserable. My mother in law decided to shelter in the car with Floss, and Al and my father in law stood patiently waiting to watch me on the cross country, only to see me walking round the corner with an expression as dark as the clouds above after we got eliminated halfway round… This time, the sun was out and I assured my father in law that his support would not be wasted and we would most definitely be getting round. We didn’t disappoint – a steady, confident and rhythmical clear as you would expect at this level. The only near cheeky moment was at the novice table, which had not been crossed off and which Corey locked on to. I was very very tempted to let him take it on but thought better of it and carried on just enjoying the 100 course. We had such a good day that I briefly considered sticking to competing at 100 for an easier life… a very short lived thought. I’m far too ambitious and also too competitive to be happy doing 100 and not winning every time haha. The dressage was a bit of a write off due to the wind. I was really impressed with how well behaved Corey was when he had a big excuse to play up, but I decided not to ask for much. In any case, trying to do leg yield into gale force winds is tricky to say the least! Still, he did a solid test that got us into the top 10 and I learnt that the way to stop him being silly on the way back to the trailer is to ride into a 40mph headwind. Not sure how I recreate those conditions though. We’ve started following Nicki’s lead and wearing spurs for the jumping phase, which has helped massively. Previously I felt like it just made him too flat and fast, but with his improved strength to sit behind and my improved feel for a good canter, now I think it helps me get the rhythm. For the first time in a long time I felt confident in both the warm up and the ring that I could get the canter I needed, I could keep it, and that we could sail calmly round a novice course. We nearly had a sat nav error and missed the 7th out altogether but thankfully I realised just in time to swerve back on to the line. The ground was slightly sticky so I had to ride more forwards than planned, but as Mum asked “Did you ride how you wanted?” I replied with a big smile “I rode how I needed – more forwards but still without panicking, hooking or driving, and I am very happy with that”. He had rattled some poles and in the wind I couldn’t hear if they dropped or what score was announced so it was an extra bonus to hear we’d gone clear. Then came the cross country – an absolute BLAST. Corey and I set off determined but steady and jumped out of our rhythm the whole way round. I didn’t panic or even worry once, I trusted him and he rewarded me with a really solid performance, not once thinking of anything but jumping between the flags. Even the logpile corner that has been my nemesis for years was just another fence to pop over. We cruised round with the same confidence that we’d had round Richmond, and to reflect afterwards that we’d completed a novice track with that level of assurance is so satisfying it is hard to put into words. We picked up quite a few time faults to drop us out of the placings but who cares – we’d gone double clear and got another point! I pulled up after the finish and, nearly in tears, said to Mum “for all the right reasons, that is my last event of the year. 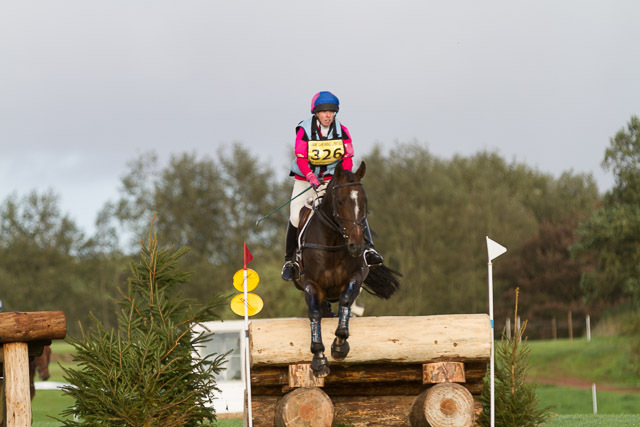 We could not have gone better and it is a great note to end on.” The memory of that cross country round is going to stay with me all winter and I am already planning my campaign to Chatsworth CIC* in 2019. Best ask Santa for a tailcoat!